Located in the center of downtown Washington, D.C., President's Park includes the park land and gardens surrounding the White House. Amid the vibrant city life of our nation's capital, President's Park offers visitors, district residents, and the President of the United States restorative green space, awe-inspiring memorials, and the White House itself to contemplate as a symbol of the United States and democracy. The grounds of President's Park are open year-round. Temporary area closures may be in place due to events and activities. U.S. Secret Service operations may also temporarily affect access to areas of the park. The Visitor Center is open daily from 7:30 a.m. to 4 p.m. (Closed on Thanksgiving Day, Christmas Day & New Year's Day). None. Tours are also free. Find the "BIG RED ONE" flower bed during the spring and summer seasons. 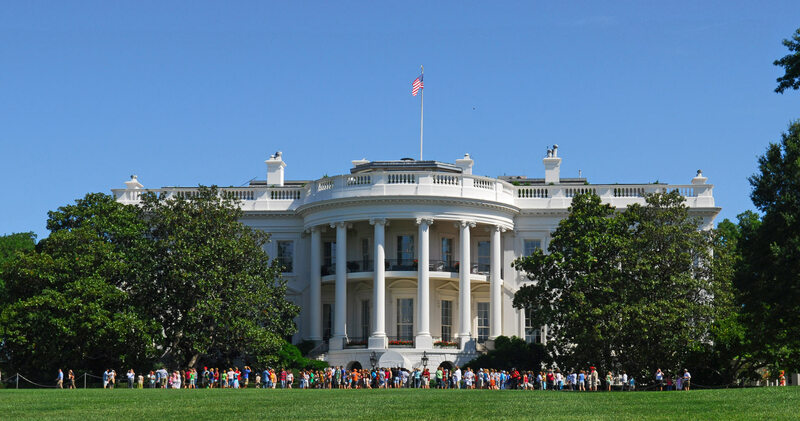 Participate in annual special events such as the Easter Egg Roll, White House Fall and Spring Garden Tours, or Christmas Pageant of Peace; stop by the Ellipse Visitor Pavilion or the White House Visitor Center for the most current schedule. Observe park wildlife such as gray squirrels, migratory birds, and an occasional sighting of a red-tailed hawk, or bald eagle. For your safety, please do not feed the squirrels. They will bite. Take photographs of the White House, Washington Monument and Jefferson Memorial and the surrounding monuments and buildings. Visitors can view, listen, and interact with a number of exhibits in seven different areas of the Great Hall. The centerpiece of the introductory gallery is a large White House model with an interactive touchscreen allowing visitors to explore the White House's architectural changes over time, milestones, and other White House activities throughout its history. Other exhibit areas include approximately 100 historical artifacts, history and geography of President's Park, and the White House's role as a stage, home, office, and museum. The new film, The White House: Reflections From Within, offers a reflection of White House experiences from the point of view of Presidents, First Ladies, and First Family members. The film is opened-captioned for those who are hearing impaired or deaf. The new White House Historical Association's new retail store features beautiful gifts, publications, collectibles, and many other items inspired by the White House. The treasured White House Annual Christmas Ornament is also available. All products sold reflect and support the associations educational mission to enhance the understanding, appreciation, and enjoyment of the executive Mansion. Proceeds from the store contribute to the Association's mission including support of the White House Visitor Center. Public tour requests must be submitted through one's Member of Congress. These self-guided tours are generally available Tuesday through Saturday (excluding federal holidays or unless otherwise noted). Inside the Ellipse Visitor Pavilion is a concession stand, restrooms, and an information desk. The remodeled visitor center is designed with a strong focus on accessibility for all visitors. The project team worked closely with the National Center for Accessibility to achieve a fully accessible experience. All new interactive and tactile exhibits offer visitors a greater chance to find their connection to the President's House. Fore example, visitors will be able to touch tactile maps, pieces of stone used to construct the White House, and replicas of significant objects like the North Portico door knob . Visitors with vision or hearing impairments may request equipment at the information desk to experience the comprehensive audio tour for the museum's exhibits and interactive elements (all film and audio components are open-captioned). Within the approximately 82 acres of President's Park are countless opportunities to learn more about the history and culture of the United States. Together, the people, places, and stories of the park speak of the rise and growth of American democracy, landscape design, technology, and other broad themes.